Mercedes Lackey has been reviewed many times here at SBR, and for good reason. Her books are the ultimate page-turners; some are better than others, but nearly all of them hold my interest until the final page. Tonight it’s time to review BASTION, book five in Lackey’s Collegium Chronicles, and the follow-up to that, CLOSER TO HOME, billed as the first in her new Herald Spy series. Both feature Herald-trainee Mags, his love interest Amily (partially disabled — she has a lame leg — and daughter of the King’s Own Herald, Nikolas), and Companions galore, but both stories are markedly different otherwise. BASTION starts off with Mags, Amily, their best friends Healer Bear and Bard Lena (recently married), Herald Jakyr and various Companions (bonded souls in the form of white horses) trying to figure out what is their next move. Everyone knows that Mags is in trouble (see the reviews for both CHANGES and REDOUBT if you don’t believe me), they know he’s being hunted…and they also know that if Mags himself is unavailable, the hunters will take revenge on his nearest and dearest. So the decision is made that they will all go to ground in a place that’s easily defensible, or a bastion. Provisions are bought, traveling is done, a few minor skirmishes are encountered, and then, finally, we find out who’s hunting Mags and why. Because I’ve read every book set on the world of Velgarth known to man, I’ve seen most of this before. The only new stuff here is the interplay between Mags and Amily — new lovers, just trying to find their footing with each other — and a rekindling of love between Herald Jakyr and another member of the party. Mind, I enjoyed those things. I appreciated finding out, finally, about why Mags has been hunted. I also relished the journeys they had to get there, as there were some deft moments of humor that cut the tension nicely. And the fight scenes were clever, the mind-magic was well-done…all good. But there was something here that didn’t quite meet my expectations, and I can’t quite put my finger on it. Perhaps it’s the fact that Ms. Lackey has written at least thirty novels in this particular setting — Velgarth — full of Heralds, Companions, derring-do, villainy that must be thwarted, and much more. And amid those thirty novels are some true gems, including her first-ever trilogy, ARROWS OF THE QUEEN, ARROW’S FLIGHT, and ARROW’S FALL. I mean, this lady started off with a bang, OK? And over time, she’s had other winners like MAGIC’S PAWN and MAGIC’S PRICE, EXILE’S HONOR, BY THE SWORD, OATHBREAKERS…these are all compelling stories with richness, freshness, compassion, energy, and all of them make you want to read them and re-read them until your eyes get tired. Then re-read them again. BASTION is not up to that standard, I’m afraid. It’s a decent, hard-working novel with a nice protagonist, a nifty heroine, and a better-than-average antagonist (whose relation to Mags must be read to be believed, but makes sense in context). It made me laugh several times, it made me cry at least once, and I enjoyed it…but I cannot imagine re-reading it. CLOSER TO HOME is the first book in Lackey’s new Herald Spy series, featuring Mags, now a full Herald, and Amily, who’s still involved with him. Amily has a job of her own now — she’s a scholar, and a good one — and both Mags and Amily are stationed in Haven and are taking their first steps into adulthood, albeit under the guidance of Mags’ mentor and Amily’s father Nikolas, the King’s Own Herald. All of a sudden, Amily must become the King’s Own. She’s a smart young woman, and took many of the same classes Mags did — including self-defense, equitation, mathematics, and more — but the King is not pleased that Nikolas is no longer the King’s Own. And that creates many new problems, some that are resolved easily…and some that aren’t. This was a welcome addition to the Valdemar canon, and I appreciated it very much. For the most part, I enjoyed CLOSER TO HOME quite a bit. It’s a nice start to a new series, a fast, page-turning read with some interesting things going on that I didn’t expect. 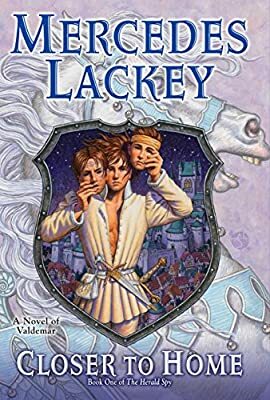 I didn’t necessarily like all of them (that Romeo and Juliet subplot being a case in point), but I give Ms. Lackey big “props” for doing something new and fresh with her long-running Valdemar series. Bottom line: While both BASTION and CLOSER TO HOME kept me turning the pages, I was left ever-so-slightly dissatisfied. And while CLOSER TO HOME was by far the better of the two books, it’s still not up there on the “Keeper” shelf with Lackey’s best. This entry was posted on November 23, 2014, 12:45 am and is filed under Book Review. You can follow any responses to this entry through RSS 2.0. You can leave a response, or trackback from your own site. Just as with RAH, even the “lesser stuff” is better than most people’s best. No one is consistently great. It’s impossible. True, Walter. But I call ’em as I see ’em…with someone who has such a long baseline, it’s easier to compare apples to apples. Personally, I liked “Closer to Home” very much (even with that odd R&J inspired subplot). It reminded me of “Arrows of the Queen” in some respects, and had a lot of freshness and appeal. I’m not sure how many of my reviews you’ve read, but if you’ve ever read my blog when I’ve talked about reviews, I’ve said before how odd it is that the stories I often like the most tend to grade out at a B-plus. (There are some exceptions to this, mind. Anything Katharine Kimbriel writes, I’m going to be right there.) Something that gets a B-plus from me mostly means that I loved the story and characters but thought there were a few things that, upon reflection, I didn’t care for. Sometimes I’ll mention what those things are in a review; sometimes, if I feel there are major spoilers there, I don’t (as in this case). Anyway, “Bastion” was one of those stories that I loved while I was reading it, but when I put it down, I realized how many things weren’t up to par. That doesn’t mean it’s a bad story; if it’s the first Mercedes Lackey story you’ve ever read, you’re going to enjoy it. It just means that it’s not as good as most of the others I’ve read, which is why I graded it out as a C-plus.